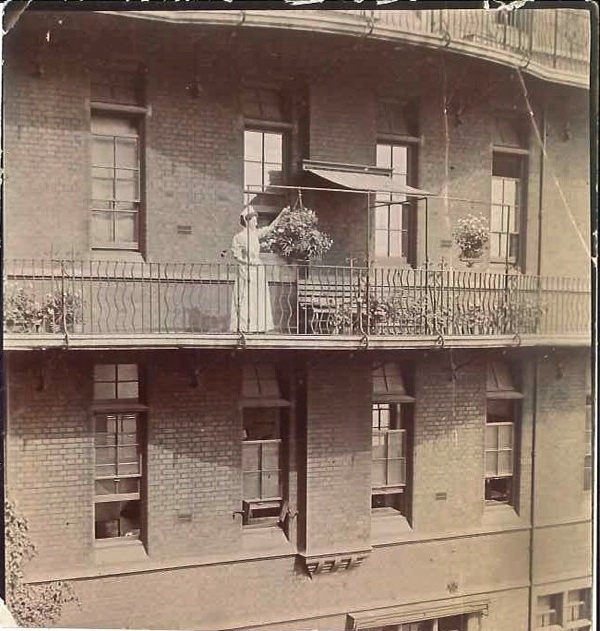 One morning in 1866, a letter arrived at the table of the Rev William Pennefather who, in 1857 with his wife Caroline, had set up the Association of Female Workers based at Mildmay Park, Newington Green in North London. The Association provided an outlet for the energies and abilities of women who had a social conscience. 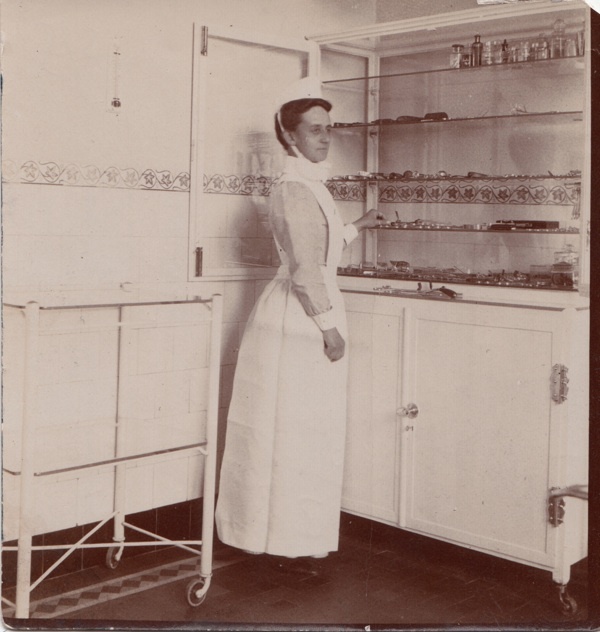 Women were trained in a variety of subjects, one them being nursing. Known as the ‘Mildmay Deaconesses,’ they were self-funded women predominantly from the upper classes. 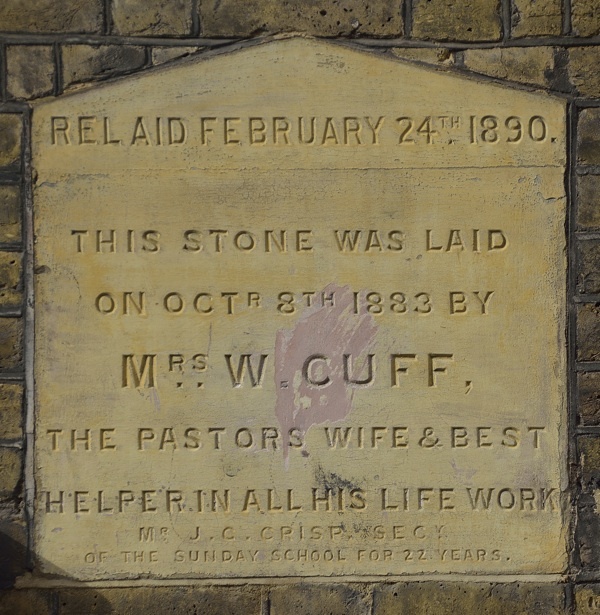 The letter that arrived that day was from James Trevitt, the Vicar of St Philip’s Church in Mount St (now Swanfield St), which lay at the edge of the infamous Nichol rookery, just west of Columbia Rd. He asked if the Deaconesses could come down and help in the terrible crisis being played out there. Death carts were rumbling all night, people were dying like flies and the stench was terrible – cholera was raging unchecked. Mildmay Park may have been a little run down but Bethnal Green was the slums where thieves and robbers lived, an area in which the police would not venture alone. It was a place of prostitutes, drunkenness, violence, nefarious street urchins and filth – not quite what the young ladies had signed up for. Later that year, two women – one Gertrude Villiers Stuart, the other anonymous to this day – emerged from Shoreditch Station wearing crinolines and bonnets to do their duty, as they believed their God wished. 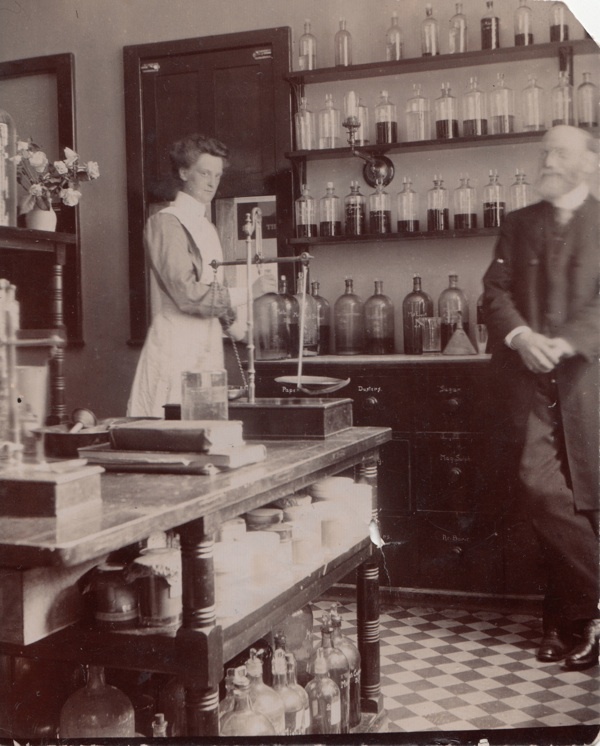 It is unlikely that they had any influence upon the lives of the cholera sufferers for, although the water-borne transmission of the infection was known, any meaningful treatment remained unavailable. 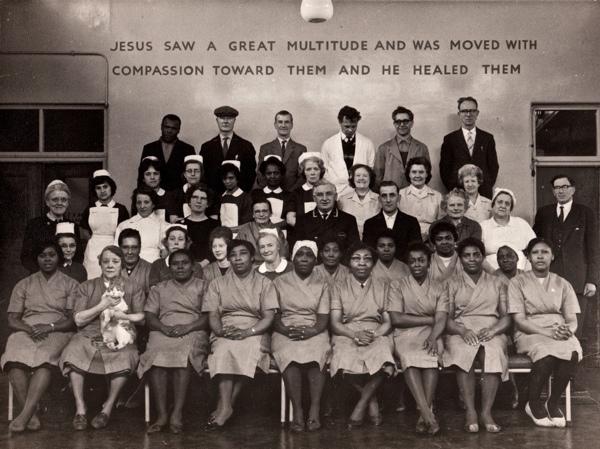 Eventually, the epidemic burnt itself out but the Deaconesses kept coming, every day, to Bethnal Green. 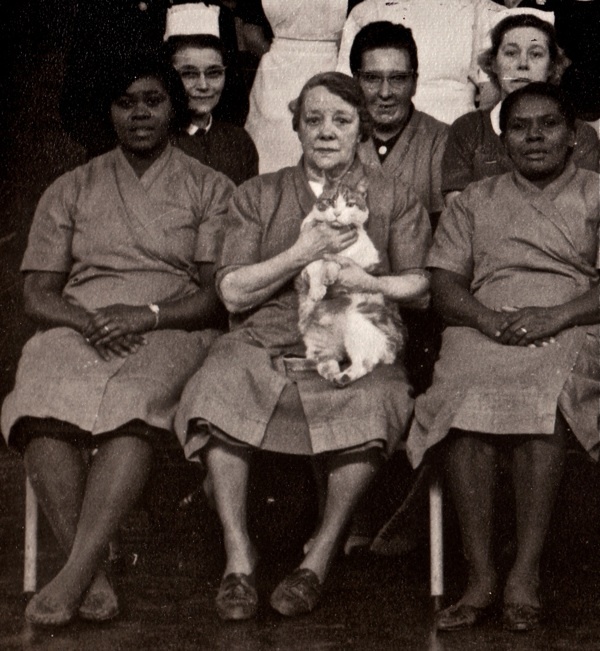 A base for their work was established in Cabbage Court (Little Bacon St), south of Bethnal Green Rd, where they set-up a Soup Kitchen, a Lads’ Institute, a Men’s Lodging House and a Mothers’ Meeting Club – offering a sewing class for factory girls and eighty meals a day for destitute children. Unsurprisingly, in a short while they were able to walk freely around the area without any fear of molestation. 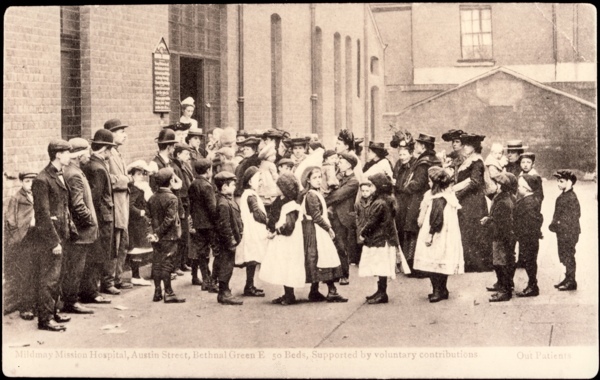 In 1874, a Mildmay Medical Mission was established, moving around the corner in 1877 to a derelict warehouse in Turville Sq, in the heart of the Old Nichol. 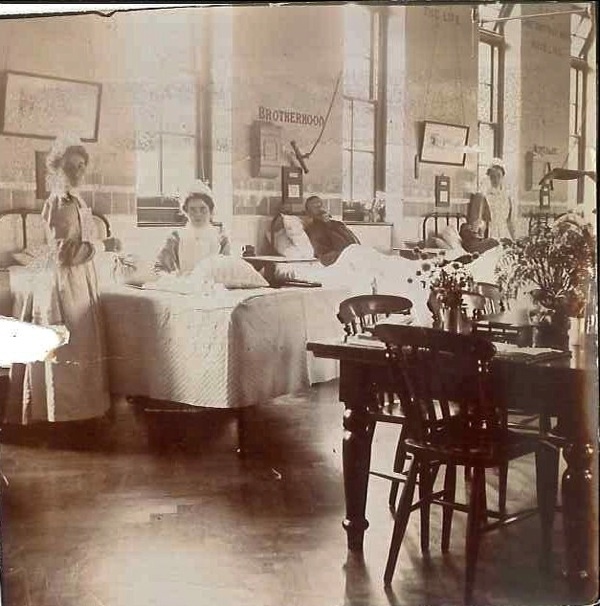 This was the first and, today, the only remaining Mission Hospital in London. 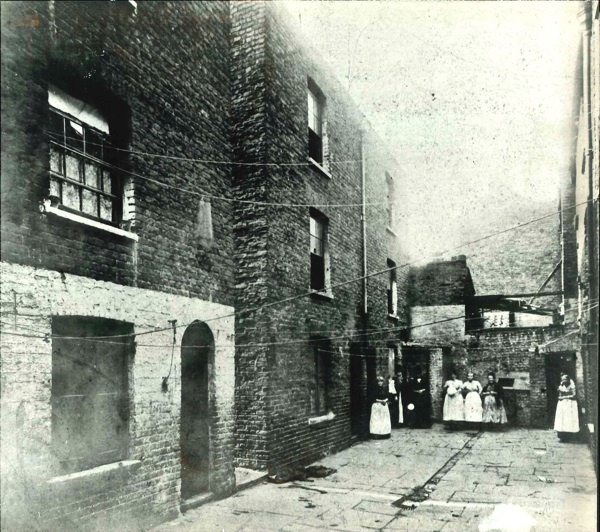 The appalling conditions which existed in the Old Nichol led to it being the first area cleared by the newly formed London County Council in 1891. In light of the impending demolition, it was decided that a new hospital should be built in a quieter situation. 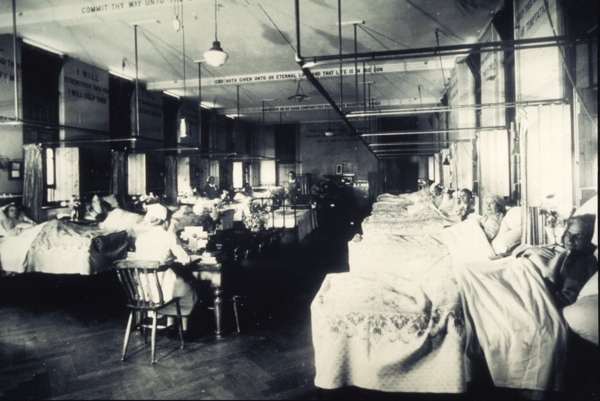 Austin St was chosen and, in 1892, a fifty-bed hospital was opened which served the local community until 1982. Sadly, the ability of the Deaconesses to wander the streets alone dissipated. By the early nineteen-hundreds Kemp, the Head Porter, would be informed of the housebound sick by relatives and friends. It was he and his colleagues who would carry the patients to the hospital using blankets, bath chairs or even slung over their shoulders, if needs be. 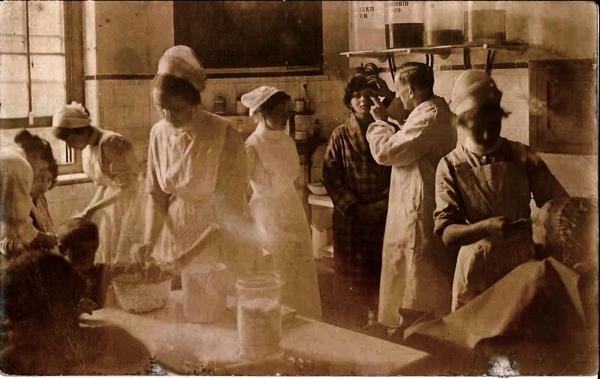 Like the dispensaries of St Saviour’s Priory in Haggerston and Queen Adelaide’s Dispensary in nearby Pollard’s Row, the maladies treated at Out Patients were those of the poor – tuberculosis, typhoid, accidents at work and home, scabies, pneumonia, bronchitis. The dispensaries had little in their armoury to offer other than cough mixtures, cod liver oil and carbolic lotion for nits. 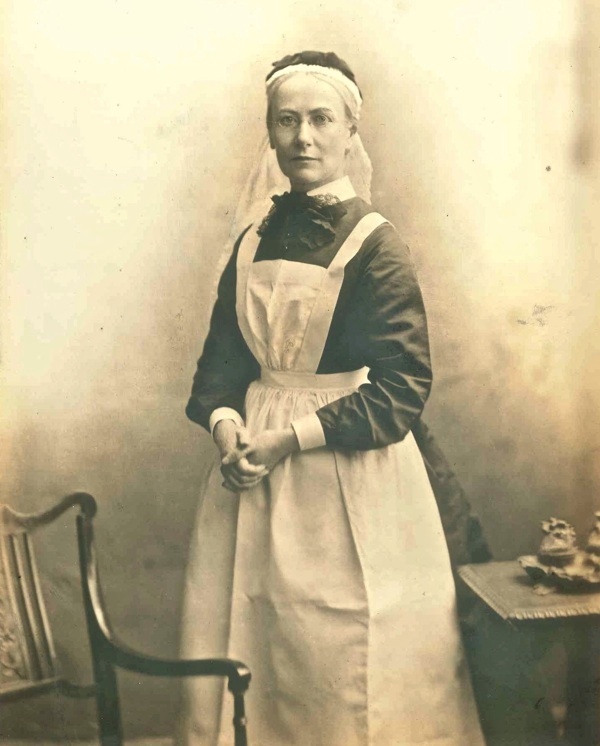 Yet the Mildmay offered a civilised way to die – in a clean bed, with the security of a warm meal and care from women who were referred to as ‘Angels’ right up until the nineteen-sixties. More recently, as an AIDS hospice, it has provided succour to those who contracted HIV and today a new hospital is being built on the site, ensuring that the Mildmay tradition of care goes on. Sister Louise Blakeney, First Theatre Sister, 1909. 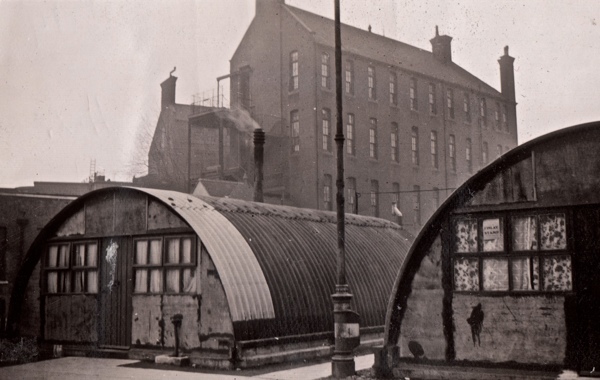 The Mildmay Hospital with extra wards in Nissen huts during World War II. Detail, showing the Milmay cat. Many famous faces visited the hospital during its time as an AIDS hospice. The young man with Liz Taylor died soon after this photograph was taken. 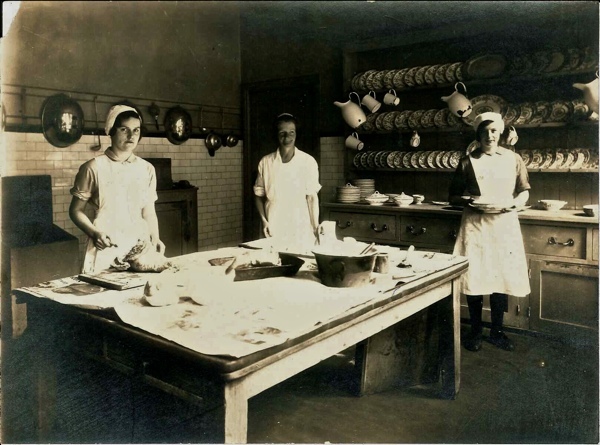 I found this article fascinating, from the history and so many manifestations of the hospital. Loved the photos. Thanks for sharing. What a wonderful article! In September Mildmy moved into our brand new purpose built hospital, built on almost the same land where our Victorian hospital once stood. The two wards are named after our founders William Ward and Catherine Ward. Mildmay is the only centre in Europe providing specialist care, treatment & rehabilitation for people living with HIV related brain injury. Many patients arrive gravely ill, unable to walk, talk, speak or feed themselves. Thanks to our intervention and rehabilitation, around 80% of patients return to independent living. We think our founders, would be proud. Very evocative. I can smell that pharmacy! Forgot about Liz Taylor doing lots of AIDS patient visiting, good for her. My parents worked as GP and nurse at a local small ‘cottage’ hospital. There was a great degree of camaraderie. Wonderful again Lin, many moons ago I had to have some investigations done at the Mildmay, the X ray table I was fixed to was moving into various positions as needed, and every time it stopped there was a text to read painted on the wall, in the context of.. Jesus loves you.. it was a lovely touch, I have never forgotten it. Mildmay is an amazing place and articles like this are very much appreciated. 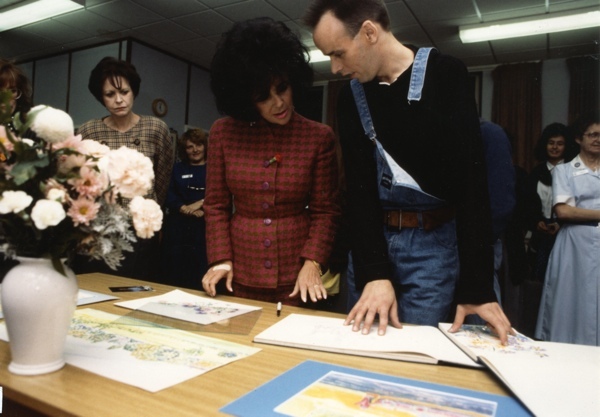 God bless Elizabeth Taylor for standing up for and standing out for gay men during the AIDS crisis . . . . and hospice nursing staff who worked under the hardest conditions. Thanks Lin for this illuminating history, and such wonderful old photos. I also remember being treated at the Mildmay as a child but cannot recall why! Years ago I read the Victorian novel “A Child of the Jago” which is based in the Old Nichol and describes the woeful conditions the local poor had to endure. God bless those brave ministering Angels! Mission Sunday School. 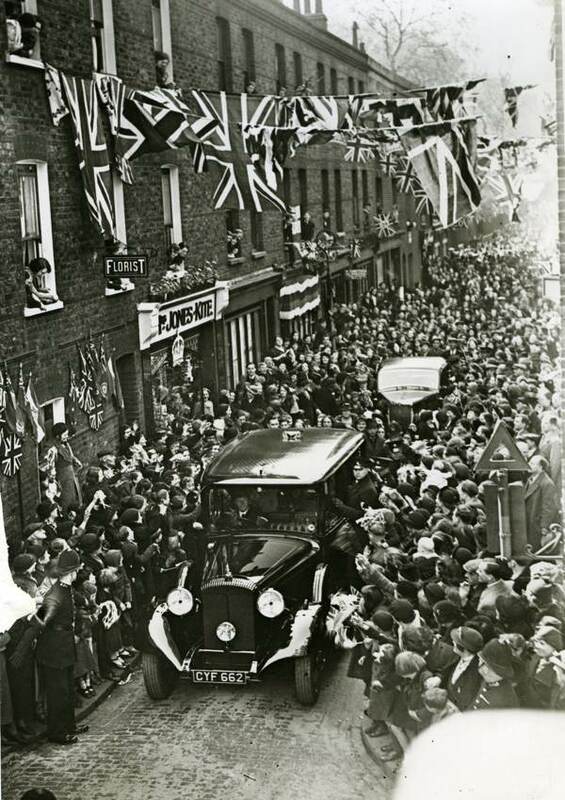 I was born in September 1933.
straight back home. However during the air raid in which a German bomb went down the air shaft in the deep shelter in the old Columbia Market (pictures exist to document it) that was on my 7th birthday, I had to stay home that night as I had pneumonia. The explosion was dreadful and many lives were lost. 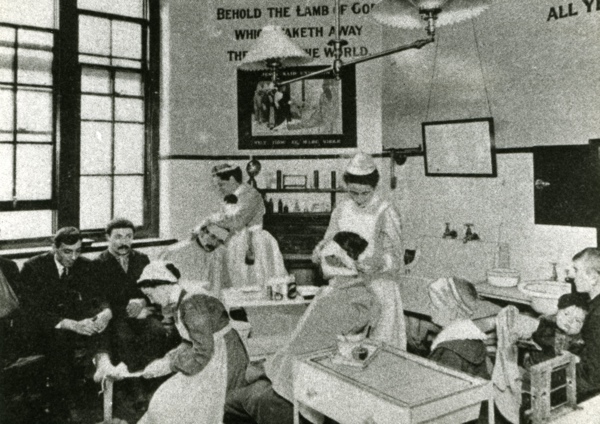 How very brave all those nurses and doctors, firemen and ambulance workers and so many others were and what a superb service at the Mildmay and other local hospitals. Eileen is my younger sister (one of twins) born 1946 and our mother died in the Mildmay, they gave her wonderful care in 1964.. I used to buy her flowers in the Florist’s shop shown in one of the pictures. Thank you for this web site. 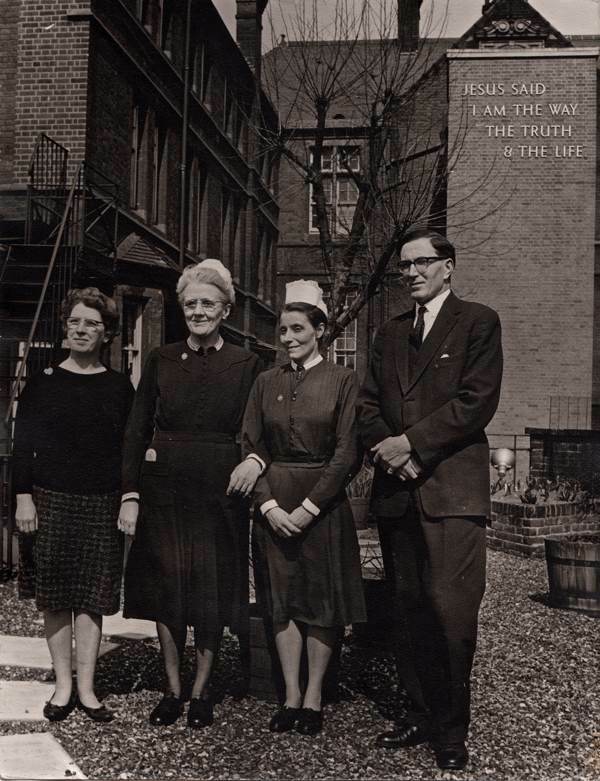 I was born in Mildmay Hospital in October 1940.. My Dad was fighting in the war and my Mum, Nan and Grandad were bombed out of their home..My Mum gave birth to me and my Nan and Grandad were able to stay at the Mildmay until they, together with my Mum and me were able to find somewhere to stay.. Wish my Mum and grandparents were still here to see this great website..